We eat large amounts of pasta, all kinds. I think noodles is my go-to food group (if noodles could be considered a food group). One of those pasta dishes that we like to eat are stuffed shells, because they are SO EASY! Most of the time we just buy them frozen from Schawn’s, add a jar of sauce bake and DONE. Love it. It’s also meatless so it fulfills the eat less meat quota. However, there is one problem with this delicious dish, one of the kids doesn’t like it. As in it makes her gag. Since she loves cheese and eat ricotta in other foods I guessed that it was a texture issue and not a taste issue. I decided to try and make my own stuffed shells that had enough other stuff in them to negate the texture off an all cheese ricotta stuffed shell. Experiment was a success. It’s meatless, not dairy-less, obviously since it’s mostly cheese. 1. Heat butter in sauté pan until melted, grate 1/2 onion using a box grater right into the hot butter. Let coot for a minute, then add mushrooms, chopped onions and red pepper. Why the grated and chopped. I wanted the grated onion to cook down, add moisture and flavor the ricotta. The chopped I wanted simply for creating a more corse texture. Let the vegetables cook until just tender and then remove from heat. 2. In a large bowl combine the cheeses and add the spinach flaking it apart as you incorporate into the cheese. This does not need to be mixed well, the idea of adding the spinach now is just to make it a bit easier to combine when adding the other vegetables. 3. Let the vegetables cool for a bit, as you do not want them so hot that they cause the cheese to start melting. Add that to the cheese/spinach mixture and mix well to get an even distribution of ingredients. 4. Put a think coating of the sauce of your choice on the bottom of a baking pan. Then begin stuffing shells. A regular table spoon does the trick nicely. The ends of the pasta should be able to touch, you don’t want the shells so stuffed that the filling leaks out but a bit of a gab isn’t an issue. (see photo above) Place the finished shells seam side down into the baking pan. Once the pan is full top the shells with sauce and bake at 350 degrees until hot and bubbly. Since I made this for just the girls and I, I only made a small pan, giving me ample amount of extra. I froze them on a cookie sheet in the freezer. Once frozen solid I tossed them in a gallon sized freezer bag. Now I have a meal at the ready. This is an easy meal to make but since there is a vegetable cooking step, a stuffing set and then a baking step it does require a bit of time before hand. 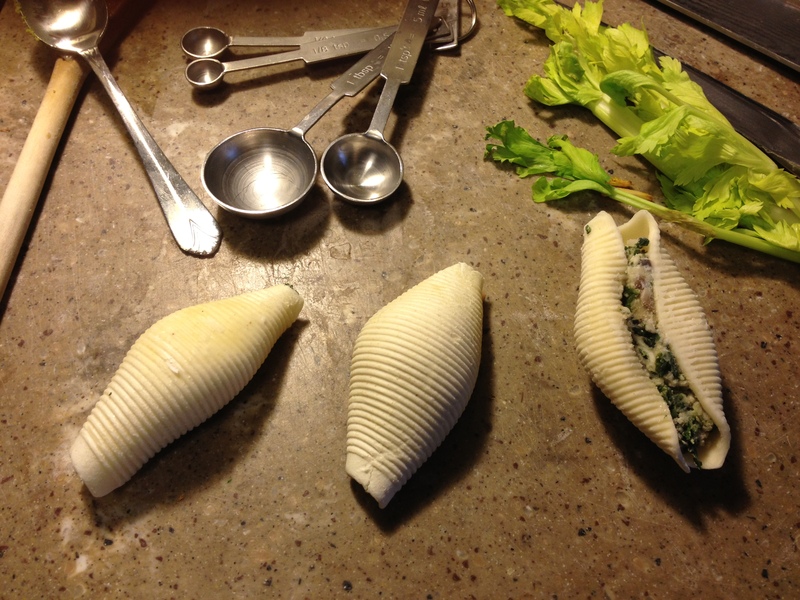 It’s a great on hand meal for the freezer that could easily go from freezer to table in 30 minutes if the shells are already prepared. It took me about an hour to prep the shells, and that was including two screaming children and having to stop every five minutes to get kool-aid, a snack or just carry one of them around for five minutes to get them to settle down. It’s a do-able week night meal for sure but I think I’ll just try to keep them on hand in the freezer for the future fast fix meals.